What should we expect finance ministers to discuss at the Eurogroup meeting this week? Euro Area economic and finance ministers will meet in Vienna this Friday, ahead of the informal EU Ecofin meeting, to discuss “policies geared at strengthening longer-term growth and employment prospects”. More specifically, the work program for the Eurogroup for the second half of 2018 lists the thematic discussion on growth and jobs to focus on allocative efficiencies in labor and product markets. In other words, Euro Area ministers will discuss possibilities to boost aggregate productivity. Total factor productivity, an economist’s favorite productivity measure, has developed quite heterogeneously among Euro Area member states since 2000. Figure 1 (see pdf), which focuses on the four largest Euro Area economies (Germany, France, Italy and Spain) and Austria (home bias), shows strong productivity growth in Germany vs declining productivity in Italy. Euro Area productivity was 5 % higher in 2017 than it was in 2000 (Germany: +10 %, France: +4 %, Italy: -5 %, Spain: +2 %, Austria: +4 %). Compared to the United States, whose productivity performance is similar to the one in Germany, the Euro Area clearly lags behind. Productivity enhancing measures are, therefore, necessary to increase aggregate Euro Area competitiveness. Deep structural inefficiencies are still present in some Euro Area economies, most prominently in labor markets. Unemployment rates have already decreased significantly since the peak during the Euro Area crisis in 2013, though, remain elevated. The last reading from July 2018 shows the unemployment rate at 8.2 %. The natural rate of unemployment, a measure of structural unemployment at which inflation remains constant, is estimated to have come down to 8.5 % in 2017, which is below pre-crisis levels. Compared to the United States, which has an estimated natural rate of unemployment at 5.2 %, the Euro Area labor market performs poorly. Figure 2 (see pdf), shows that labor market rigidities are not present everywhere in the Euro Area. Labor markets in countries like Germany, Netherlands and Austria seem to work much more efficiently than labor markets in Spain, Greece but also Italy and France. The downward trend of structural unemployment in the Euro Area has mainly been driven by improvements in Germany. Among the four largest Euro Area economies plus Austria, Germany is the only country in which structural unemployment in 2017 was below the 2007 level (Figure 3 - see pdf). Structural unemployment rates have stayed, more or less, constant in France and Austria. In Italy and Spain, however, structural unemployment rates remain well above pre-crisis levels. In Italy the double dip recession seems to have structurally weakened labor markets quite persistently. In Spain, the decrease in structural unemployment since 2013 can be read as evidence of positive effects of labor market reforms. Nevertheless, it is important to emphasize that structurally weak labor markets remain a vital policy concern in some Euro Area member states. Alternative labor market indicators support this judgment. Euro Area long-term unemployment (12 months or more) is declining only gradually and remains close to 50 % as a share of total unemployment (2017: 48.5 %). In Italy 58 % of unemployed were seeking for a job for longer than a year, while only 33.5 % classify as long-term unemployed in Austria. At the same time, the importance of temporary jobs is rising. Facilitating a transition from temporary to open-ended contracts remains important, particularly in Spain. In 2017 involuntary temporary employment accounted for 22 % of total employment. Also in Italy (11 %) and France (10%) involuntary temporary employment is elevated and well above levels in Germany (2 %) or Austria (1 %), see figure 4 (see pdf). Temporary contracts are seen as impeding faster productivity growth as they rarely serve as a stepping stone to a permanent contract and limit human capital formation. In Spain, fixed-term employment is now facilitated in the public sector and capacities to fight the abuse of temporary contracts in the private sector have been increased. Labor market efficiency can further be improved by intensifying efforts to a more complete labor market integration of migrants. Country specific recommendations by the European Commission highlight Austria and France, in particular. Figure 5 (see pdf) shows unemployment rates by country or region of birth in the year 2017. Most substantial differences can be observed for migrants from non-EU countries. Labor market integration within the European Union is more complete. 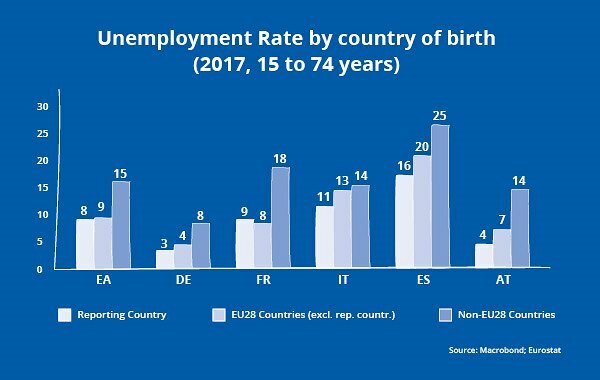 For the Euro Area, as a whole, the unemployment rate for people born in non-EU countries was almost twice as high as for people born in the reporting country. The difference is most pronounced in Austria (10 %- age points), France and Spain (9 %-age points). The impact of socioeconomic and migrant background on educational performance remains high and hampers labor market integration (European Commission). In Austria, for instance, 22 % of people with non-EU migrant background between the age of 18 and 24 years classify as early leavers from education and training (2017, Eurostat). For people who were born in Austria only 5.3 % were early leavers within the same age group. In the Euro Area this rate is similar for people born outside the EU (22.5 %), though, substantially higher for non-migrants (9.5 %). Improving migrants’ skill levels is the key to more complete labor market integration. Higher skill levels improve labor market integration for people with and without migrant background. Moreover, a better educated labor force is associated with a more productive labor force. Even in very tight labor markets, such as Germany, efficiencies can be improved. Germany performs relatively poorly with respect to aspects of life-long-learning. Only 8 % of Germans between the age of 25 and 64 participate in lifelong learning (2017, EU-LFS). This is the same rate as in Italy and well below the Euro Area average at 11 %. France (19 %) and Austria (16 %) show a comparatively high adult participation in learning which should indicate that its labor force is more adaptive to changes in the demand for skill. Overall, it can be concluded that Euro Area economic and finance ministers will have plenty of issues to discuss. The business cycle remains friendly and economic growth has become more balanced across sectors and individual Euro Area member states, in spite of a recent slow-down of economic growth. Labor markets have seen cyclical improvements but deep structural inefficiencies remain. Some steps in the right direction have already been made but more needs to be done. Structural unemployment, particularly youth unemployment, remains high and involuntary temporary employment has not yet shifted into open-ended contracts. Adapting skill sets to changing demands will become more and more important. This includes improving basic skills for disadvantaged young people and people with a migrant background, but also refers to adult participation in life-long-learning. What has already been done? Labor market reforms in Spain, Italy and France. Euro Area labor markets continue to pose significant challenges. However, quite a number of reform initiatives have already been taken to face these challenges and improve the prospects of those unemployed finding new employment. The effective implementation needs to be strengthened further, to unleash their full potential. In Spain, labor market policies target youth unemployment and old-age long-term unemployment. The Employment Activation Strategy 2014-16, which has been extended to 2020, has introduced a Youth Guarantee scheme as part of a wider EU initiative to tackle youth unemployment. The Spanish Youth Guarantee scheme intends to ensure all people under the age of 30 to receive an offer of high quality employment, education, an apprenticeship or traineeship within four months of becoming unemployed or leaving formal education. The effectiveness of these measures is, however, limited by the capacities of public employment services to provide personalized support. The same constraints also apply to promote the employability of long-term unemployed. The new Employment Activation Strategy 2017-2020, therefore, focuses on the modernization and coordination of public employment services to increase effectiveness. In Spain, active labor market policies are managed at the regional level. In Italy, labor market reforms have targeted youth unemployment, labor reallocation and labor market duality. Fiscal incentives to encourage new hires on permanent contracts have been introduced in 2015 and 2016, while incentives targeting young people and workers in the south followed in 2017. Active labor market policies, including a Youth Guarantee scheme, remain rather ineffective due to capacity, and budgetary, constraints of public employment services. Hence, similar to the situation in Spain, labor market reforms have already been introduced, however, their effective implementation remains insufficient, so far. Overall, recent reform agendas show that labor market reform is well underway. However, their implementation remains incomplete. A recent analysis by the ECB argues that previous labor market reforms have led to more flexible Euro Area labor markets (Masuchet al., 2018). Firms can adjust wages and employment more easily to changing economic conditions. More generally, structural reform can take some time to materialize in positive employment effects. Bordon et al. (2016), for instance, conclude that structural reforms have a lagged but positive impact on employment. Moreover, their research shows that “structural reforms are best initiated in conjunction with supportive fiscal or monetary policy” (Bordon et al., 2016, p.4). The current macroeconomic environment of loose monetary policy and solid business cycle dynamics would, thus, be a favorable moment to intensify reform efforts. Recent labor market reforms have focused mainly on active labor market policies, particularly on education, training and counselling. Modernizing labor regulations and active labor market policies are seen as vital enabling workers to adapt to new technologies and, thus, boost aggregate productivity.